Honestly, I wasn’t sure if I was even going to make Vin a birthday cake b/c I was pooped from winning big sister of the year award baking for my sister’s sh*t ton of marriage events. And work was ridiculously busy. Like traveling on four continents busy. And I just happened to tear my rotator cuff the week of Vin’s birthday because I am clumsy. And related to the shoulder injury, I couldn’t lift my left arm very high and was like Zoolander and couldn’t turn left unless I wanted to experience searing pain down my neck and shoulder blade. All these odds were not in his favor, Katniss, HOWEVER… I did have a lot of extra sheet cakes and frosting in the freezer from baking for my sister’s wedding so this saved me a lot of prep time. And a couple days before Vin’s birthday, I stayed up late to layer and stack and shape and dirty ice a sneaker while he was asleep, so the morning of Vin’s birthday, I actually decorated his cake. 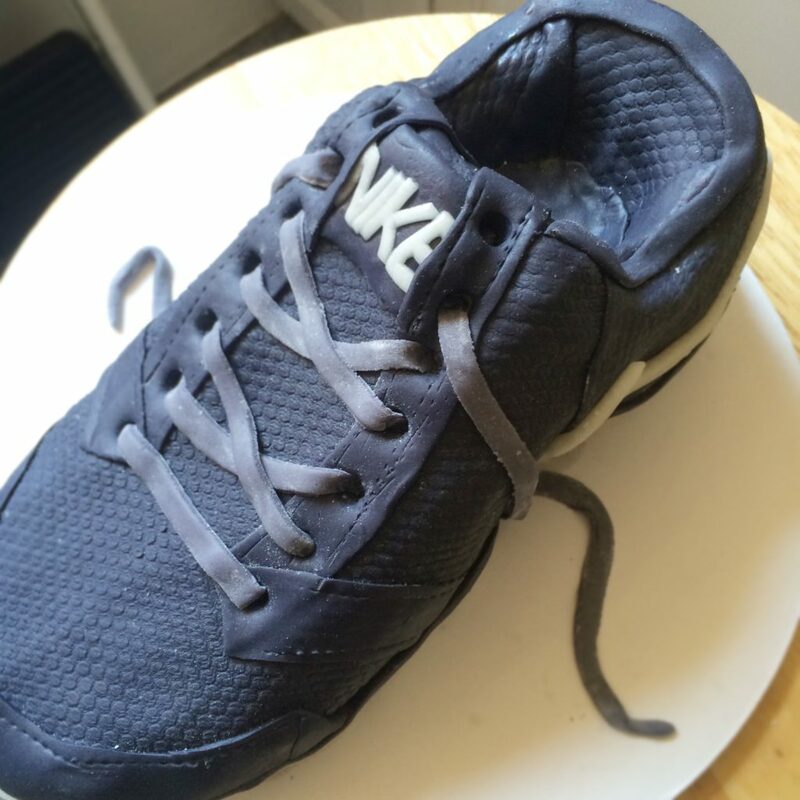 I was able to hide the sneaker shaped mass in the fridge because I just put it in a white cake box. 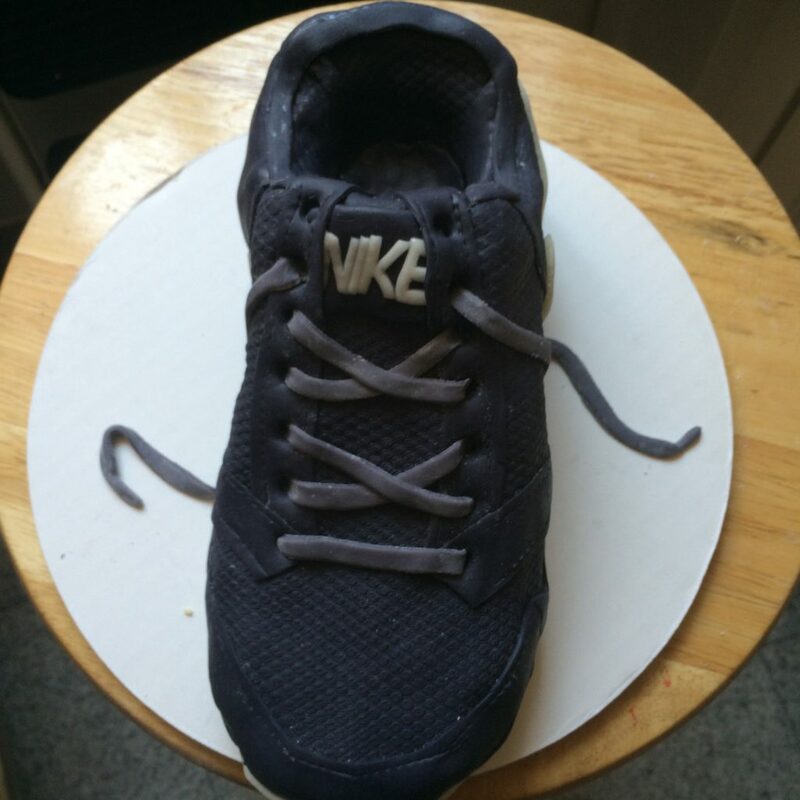 The cake ended up being closer to my actual sneaker size because a Vin-sized sneaker cake would not fit in on a 10″ round. Plus, that’s a shitload of cake. Who the hell would eat all of it? I got a late start to decorating the cake b/c I couldn’t take the pain anymore and scheduled an appointment to see a pain specialist for my shoulder. The doc was really patient and tested my arm and neck movements (SUPER limited) and hooked me up to this machine that sent pulses to my muscles and had a giant ice pack wrapped around my shoulder. That really helped, but he was concerned (hell, I was really worried) that my finger strength was pretty weak. I was told to come back first thing Monday. The adjustments and STIM treatments helped a ton though since I was able to lift my left forearm to elbow level, which was just high enough to decorate a cake on my kitchen counter. 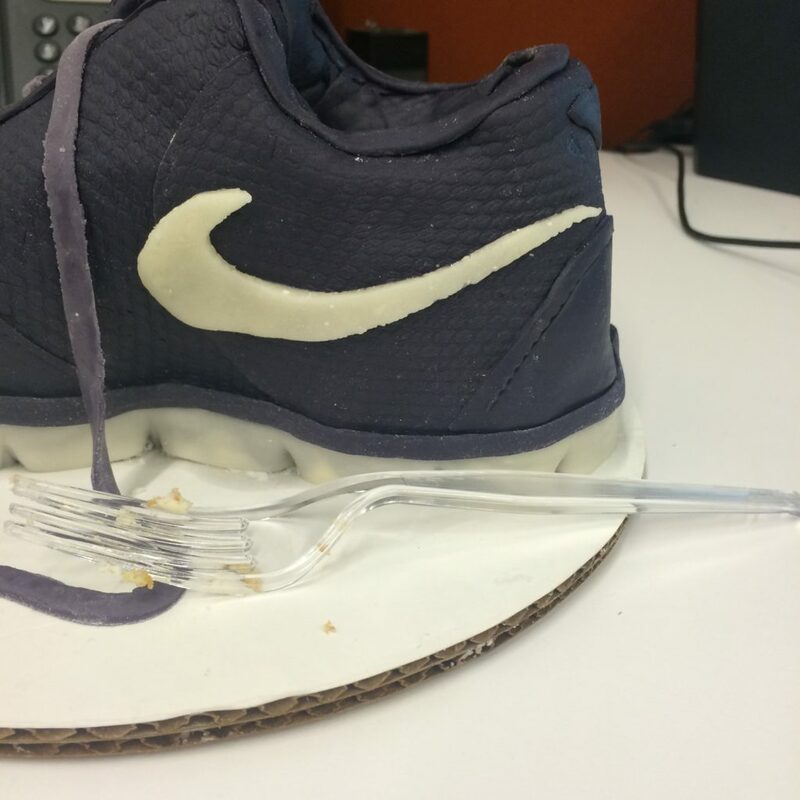 I took a chef’s knife to the hardened dirty iced cake to shape out the shoe curves and cut out a hole where an imaginary foot would slip in. I had some dark marshmallow fondant ready made (thank GOD b/c I would NOT have been able to knead a new batch of fondant with my shoulder in this condition). The color didn’t quite match Vin’s shoe, but whatever. Close enough. I rolled out a chunk on my kitchen counter and sliced out a patch to cover the back of the shoe. Top view… to be edited. Looking at the photos of Vin’s sneaker, I saw all this mesh all over it and decided there’s no f’ing way in hell I’d create thousands of little marks by hand. It was kitchen McGyver time, and I took a clean netted bag and pressed it on rolled fondant. The imprints were perfect and it took all of 3 seconds. Boom. I draped the textured fondant over most of the shoe and just trimmed off the excess. 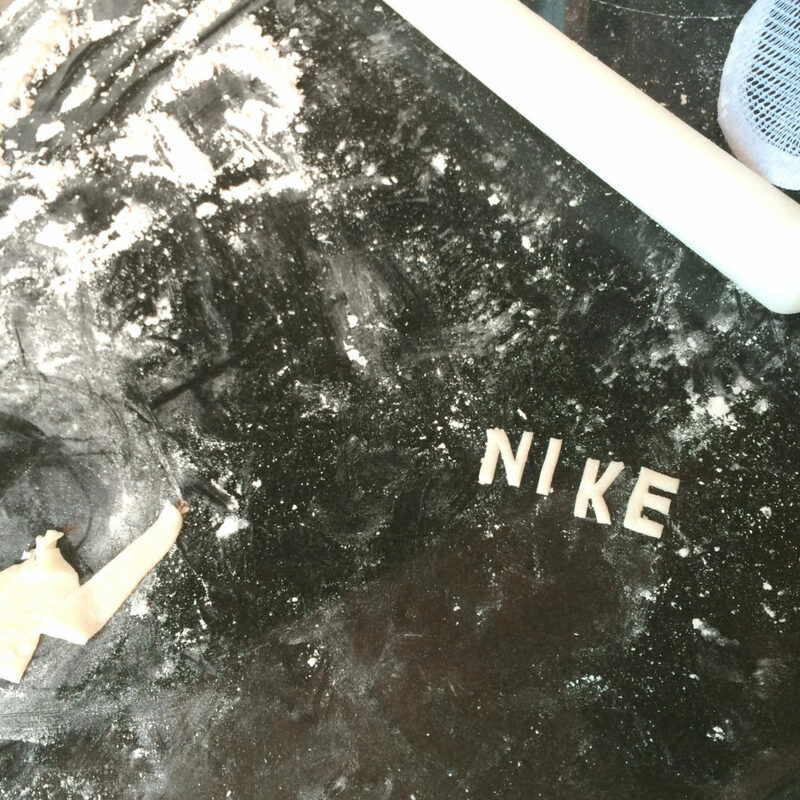 A plain piece of dark fondant was placed in the carved out section for the insole. I tried to cut out the decorative pieces of the shoe and place them as best I could, but I ended up creating a completely different sneaker design. The part where the laces go through looked nothing like Vin’s shoe, but I was getting tired and achy and still needed to go to work. Oh well. I just took a straw to make the lace holes and left it at that. And the finishing touch was the laces. I kneaded a small piece of the dark fondant with the remaining bit of the plain fondant to make this greyish-lavender color and cut out thin strips for the laces. 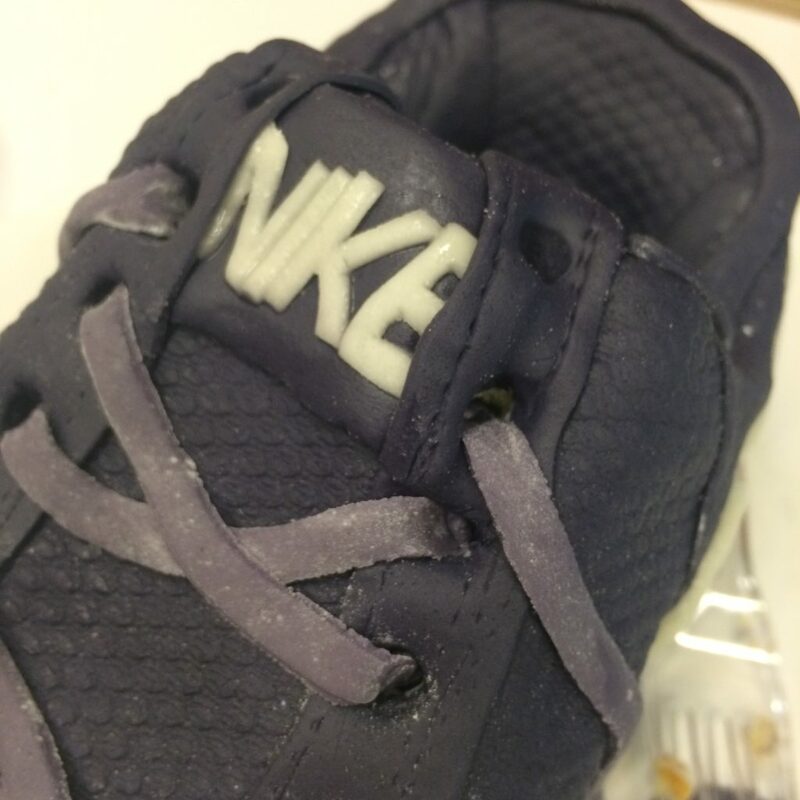 It was just weaving in and out, alternating between the lace holes, and voila… a sneaker cake. I should have dusted off the rest of the sugar better, I should have taken more WIP shots, I should have followed the design more closely… but I just wanted to finish, snap a few shots, deliver this to Vin and then get to work. 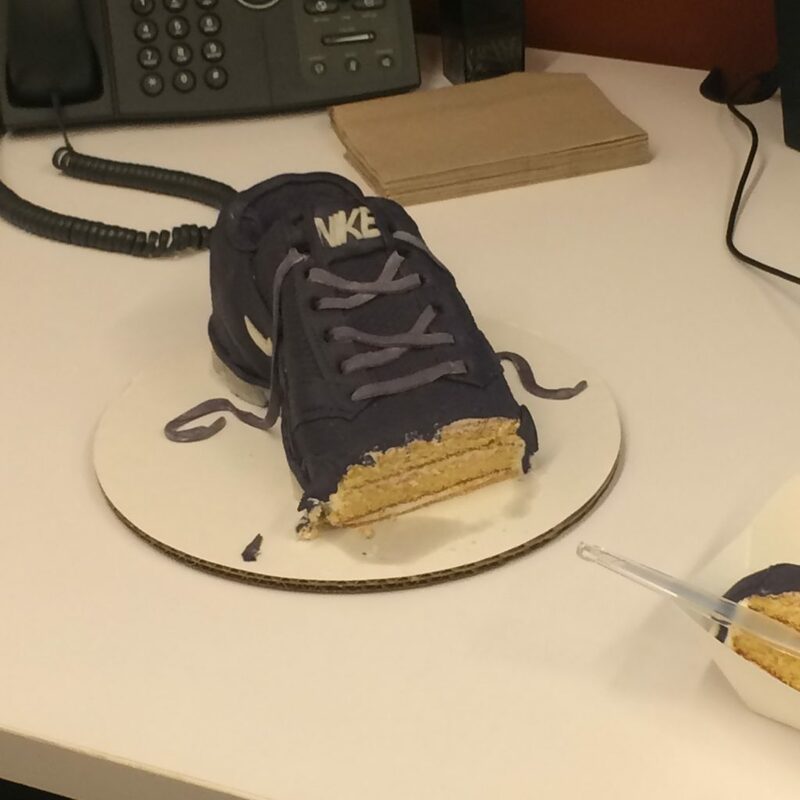 I brought it to his office so he could share with his coworkers and they were like, “It looks like a worn in sneaker!” I posted it online and some people didn’t get why I would just show a pic of an old shoe until they read the description. This was pretty funny. 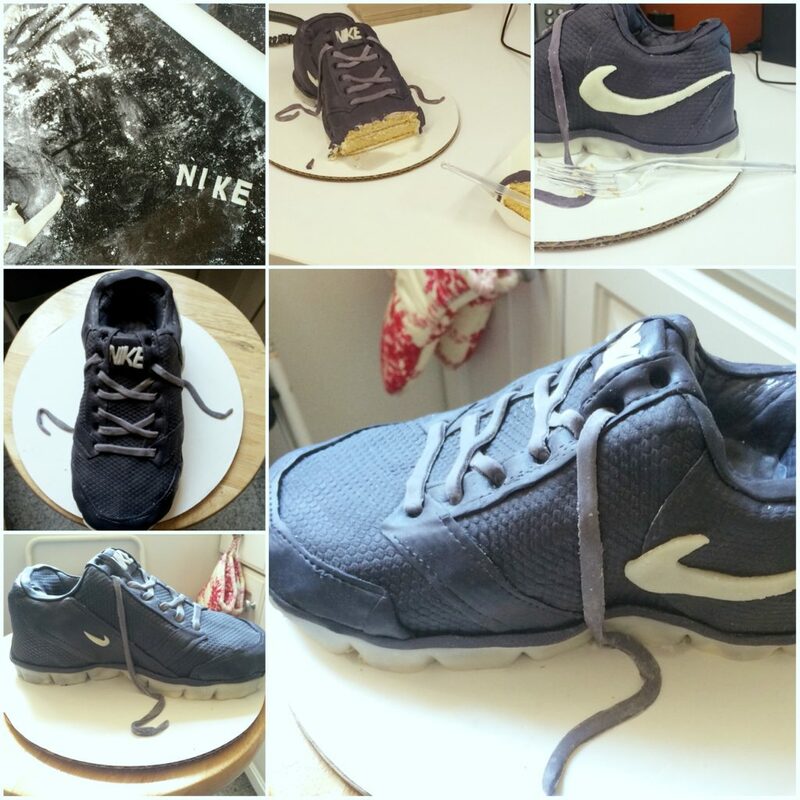 The sneaker cake was by far not the best I could have done, but I have to say, it came out pretty damn well given limited arm ability. The birthday boy was really thrilled, too, and he actually didn’t share much of it at the office.